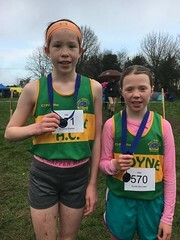 Athletes from the County have been very successful in competitions over the past couple of weeks and the club would like to congratulate Daniel and David Ryan from neighbouring club Moycarkey-Coolcroo on their fantastic performances for Ireland at the European Youth Olympics and the Celtic Track & Field Championships. Special mention also to all County athletes who competed in the National Track & Field League. The ladies were crowned Division 1 champions while the men won the silver medals in the Premier Division. Congrats also to the management of both teams on these excellent performances.